Bale apparently wants out of Tottenham following Redknapp’s firing and Spurs unable to make the Champions League next season – http://www.metro.co.uk/sport/football/902089-gareth-bales-spurs-future-in-doubt-as-agent-admits-problem-over-euro-loss#ixzz1xmctmUeX. Bale can’t go to Real Madrid where Di Maria just re-signed and Ronaldo is the left wing. Barca are going to sign Jordi Alba at left back so there is no other place in the squad for him. Bayern Munich have Robben and Ribery. The only other places could be Milan and Inter, but Inter doesn’t have Champions League football next season and Milan probably doesn’t have the funds. Chelsea probably doesn’t buy him after buying Eden Hazard. That would leave maybe Manchester City, PSG and maybe Arsenal. Doubt he wants to go to PSG and Arsenal probably doesn’t pay up with Theo Walcott and Alex Oxlade-Chamberlain on the books. Why doesn’t United sell Nani and buy Gareth Bale? It would be a like for like winger signing except that Bale plays on the left – that would make Valencia the starter on the right wing and Ashley Young can play either wing or in the slot. It would the Welsh Wing Wizard part 2. Bale would get Champions League football and wind up where he should have gone in the first place. And Nani looks like he needs a fresh start and probably isn’t an automatic selection for United’s starting XI. Still sticking with Liverpool eliminates Real in the second leg with a goalless or 1-1 draw. Keys: Will Arbeloa be available at right back. If so, then they will have Mascherano and Xabi to playing holding – maybe even bring in Lucas – with Gerrard, Kuyt and Babel or Ngog. Torres off the bench if required. Real are going to have be patient else they will be two goals down overall with Liverpool hitting them on the counter. Best best for a first half goal is off a set piece. Get Mascherano on a yellow early and it will reduce his aggression which is key to getting a foothold in midfield. Also, can Liverpool handle Robben on the wing? I think they will as they will double up with a midfielder and the left back (probably Aurelio) on Robben. Potential surprise matchwinner: Out of favor Van der Vaart or Schneider. Observation: For an English team vs a Spanish team, there sure are a lot of Spaniards on the English team and more Dutch players on the combined squads than any other contingent. 1. Liverpool eliminates Real in the second leg with a goalless or 1-1 draw. 2. Chelsea will squeak through against Juve on away goals as I believe they will lose 2-1 in the return leg. 3. Porto through over Atletico (after games with Barca and Real Madrid they are going to be spent), Bayern over Sporting (way out on a limb on that one! ), Villareal over Pana (toughest one to pick but I just think Villareal will be better on the road in this one as they will be more solid at the back). 4. Arsenal is going to beat Roma in the second leg at the Olympic stadium. They are about to score a hatful of goals and I think some of it is going to happen in this match. At worst, they tie and go through. 5. While everyone thinks it will be Barca through to the next round, I feel like Lyon can cause an upset. If Barca’s lead is down to three or less in Liga by next weekend, I predict Lyon upsets Barca. If not, Barca wins through comfortably. 6. Finally United v Inter. This tie should have been over. I am shocked at how pedestrian Inter were at home. And I can’t believe Ronaldo didn’t score at least one of the six chances he had, not to mention Giggs’ one on goalie. That Cesar is awesome. However, United has to be worried about the away goal at OT. I still think United wins, but I wouldn’t be surprised if it’s 2-0 United before Inter pulls one back and United has to sweat it out. I just don’t think Inter can keep United from scoring at home, so it’s only a question of whether Inter can score themselves. More importantly, it’s going to be based on who plays for United in the game and what the squad’s state is – go to my next thoughts before coming back to this. 7. If United beats Newcastle tomorrow, United will win the Premier League, no question. If United beats Fulham in the FA Cup on the weekend and if they don’t have to play one of the top 4 in the semis, then United will win the FA Cup. I personally think they will lose to Fulham or in the next round. More on that in a second. And if they beat Inter AND Newcastle and get knocked out before the finals of the FA Cup, they will win the Champions League. I think the Carling Cup OT is going to be a serious problem for United. It means Ronaldo and Scholes have to sit out the Newcastle game which begs the question of who starts at Fulham as the Inter game is coming up the following Wednesday. Also, with the disarray at right back, who is going to play Ibra when he floats to the left wing – O’Shea or Evans? I think SAF has to play Tevez with Welbeck at Fulham for the FA Cup along with the kids. Rest Giggs, Scholes, Carrick and Park. Play Fletch, Gibson, Tosic and Nani in midfield and Fabio, Evans, Vidic and Eckersley at the back. Forget the FA Cup if you want to progress in the Champions League. Stay or Go – Which was the better decision looking back? I’m back. Life took hold for a while and post Euro withdrawals made me take a break from blogging. But, like Rooney, I’m back. And let’s start with my last post where I stated very clearly that Ronaldo should stay at United. I want to revisit my logic and see what holds up. 1. He’s coming back to form now that his speed is returning following the ankle rehab. If he kicks it into high gear during the Champions League, he will once again be king – only and especially if he flatly denies wanting to go to Real since that nonsense has started again. Also, he needs to show more joy in the team’s performances. 2. Still stand by that. Now he has the Ballon D’Or. One more and he is at the top of the heap. And if they win a few more Champions League crowns – which they will if this team stays together – it’s guaranteed that he will be up there with Charlton and Giggs. 3. So Calderon is gone, Schuster is gone – and that was even before the season finished. Even faster than normal Real standards. And you still don’t know who the coach is going to be since Juande is only guaranteed through the end of the season. You will absolutely be the flavor till the next one comes around. And if Kaka is going to available, you might get played by Perez. 4. Still right. And United did win the World Club Cup so now they are also champions of the world. Whereas at Real you would be – well who can say given what impact you may or may not have had on the outcome. However, no quintuples on the horizon at Real for sure this year. Man U – get past Inter and draw Liverpool a few days later and I’d say you will win the league, win the Carling Cup, win the FA cup if you don’t play Arsenal before the final and will win the Champions League if you don’t have to play Barca before the final. 5. Still concur with my initial assessment. And with Berbatov at United, there’s even a better hold up man to distribute balls to you and to keep the central defenders honest instead of doubling up on you like Behrami did for West Ham. 6. Say you are staying and not going to Real right now and you will be a god. 7. Bet that. And then they will sign Aguero or the next best thing post WC 2010 and you will be like Figo once they signed Ronaldo. 8. All I can say is – Messi is a freak. He is currently like Jordan in his heyday. No one can stay with him. Ronaldo is lucky he is not playing in La Liga right now else he might not have won the Ballon D’Or. 9. Never mind that one. The way he is going with Portugal he might be back on the bench with Fergie in another six months though! 10. England is looking good though under Fabio. 11 and 12. Couldn’t agree with this more. Except you seem to keep on getting to win more trophies. 13. Kaka, Aguero and Benzema are going to move at the end of the season. Man City will throw around the cash and buy at least one or more stars – I bet Ronaldinho winds up there. Wait. This is not the time to leave. 14. La Liga is being propped up by Barca. Actually by Messi – note how they struggle when he doesn’t play a half. It’s now behind the Premier League and Serie A IMO. All in all, Ronaldo, the answer is obviously that staying was the right decision. Look at the trophies you could win this year. And next and the next. The decision should be no different at the end of the season. But, and you heard it hear first, he will be gone after this season. And United, much as it pains me to say this, should sell him. Enough is enough. Take the 100MM – and make sure Real pays that since you have Man City as a counter to threaten both Ronaldo and Real – and buy Aguero and Valencia/Theo Walcott/Ashley Cole. I like Diego Capel as a left winger, but let’s see how Tosic and Nani pan out. Frankly, United could probably bank 50MM and let the chips fall where they may. 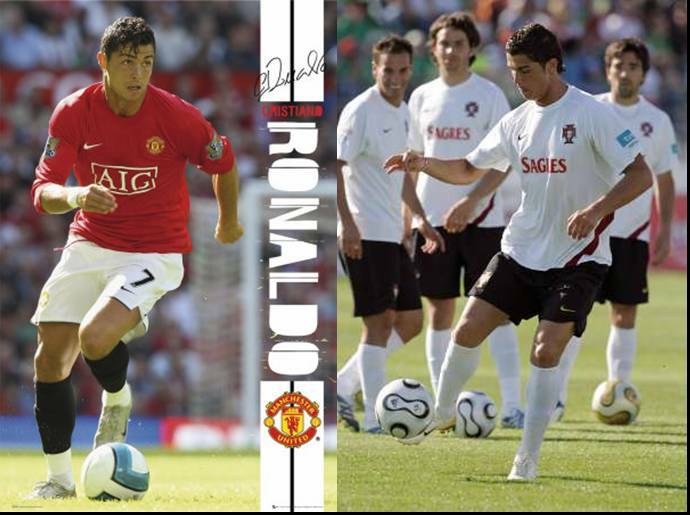 If Ronaldo doesn’t shine at Real as brightly as he shines at United, where does he go from there? Inter? Back in business. At least one half of my pre tournament final pairing is still alive with Spain coming through against Italy. This was a toss up – either side could have and should have won it. With that said, Spain deserved to win for a few reasons. They were the aggressors during the game and were looking to actively score whereas the Italians resorted to their tried and trusted catenaccio. That works when Paolo Rossi, Roberto Baggio or even Totti is your striker. Not so when Toni can’t score, Cassano is tricky only in the middle of the field and Del Piero is given only 15 minutes to do so. It was left to Camoranesi to almost score for the Italians. Except that Casillas is the king of the foot save given how much improvisation he has to do when keeping goal for Real Madrid. Torres and Villa toiled without reward and the Italian defense were great. I didn’t think they would be able to keep them out with the makeshift central pairing, but they were solid. No clean looks. Aragones, you are so lucky. Spain should have lost this game based on the moves you made. But, even a broken clock is right twice a day. Hopefully, you still have one more to go. You started Iniesta and Xavi together. Mistake. At least, you had the guts to correct the error and bring on Cesc and Cazorla (that man had the worst body language going into the penalty) in a double switch. I think you should have only taken Iniesta off. Xavi and Cesc would have been more effective at a time when you needed more passers on the field. Silva did have a decent game, but I just can’t get excited about a player who absolutely refuses to use his other foot. If he had used his right foot, he could have put at least two more clean shots on goal. Finally, the biggest gamble came off for you, but it just doesn’t make sense. Cesc supposedly hasn’t taken a competitive penalty since he was 15! You make him take the final penalty because you “felt he would score.” Unbelievable. What if he had to score without Casillas having saved Di Natale’s prior penalty? I knew Buffon was going to get one save. I just didn’t know whether Casillas could save two. Poor De Rossi has now missed two critical penalties following his Champions League miss against Man U. But at least he scored a penalty in the World Cup final. Di Natale has had a miserable Euro 2008 and completed it with a weak penalty that Casillas easily saved. Cesc, Wenger is going to be happy because this is really going to help you in your career. That’s a lot of pressure to put one away under – especially when you are facing the best goalkeeper in the world. Well done son.